New Type of Fine Particles Classifier Sharp Cut Separator | Product Information | KURIMOTO, LTD. This Sharp Cut Separator is a centrifugal, pneumatic type classifier in which the specially designed cylindrical classifying rotor rotates at a high speed. On the Sharp Cut Separator, the cylindrical squirrel-cage rotor with multiple band-plate blades arranged in a radical pattern rotates at a high speed to generate the centrifugal force due to rotary airflow and the centripetal force due to suction air, fixing up the cut size in balance between the centrifugal and centripetal forces. Coarse particles move downward along the classifying chamber wall as the centrifugal force overcomes the centripetal force. By contrast, since the centripetal force overcomes the centrifugal force, fine particles move across the blades into the inside of the chamber and then get together to the collector (e.g. cyclone or bag filter) through the exhaust pipe. 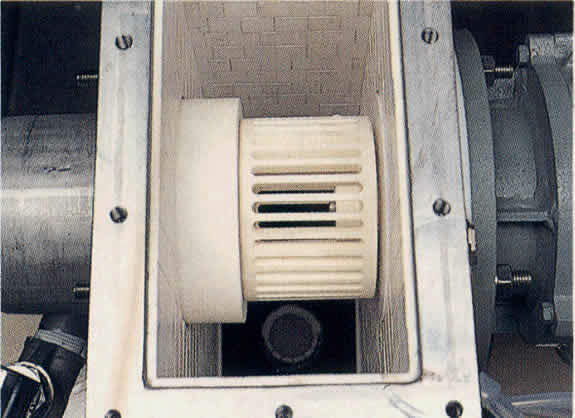 Material is fed through the bottom of the classifying chamber together with the primary air, and the secondary air is sucked through the intermediate part of the classifying chamber. Normally, materials to be classified with the Sharp Cut Separator are super fine, which are apt to cause secondary agglomeration. Therefore, adopted is the method of feeding materials with a high degree of dispersion provided by blasting compressed air as the primary air through the nozzle. The specially designed classifying rotor causes no entrainment and elutriation of coarse particles into fine particles side. The cut size is infinitely adjustable according to the classifying rotor speed and air quantity, assuring you to get right products. Increasing the material concentration only causes a minimum degree of degraded classifying accuracy. You are able to clean the separator with ease when changing over the materials.